According to Doug Smith, more than three dozen DNR officers served search warrants to a group of men illegally catching and selling fish on a lake in 2014. The bust saw several men go to jail and ended one of the largest poaching rings in the country. DNR officers handle many similar jobs every year. They investigate claims of illegal activity involving conservation efforts or animals in their states. This can lead to arrests and jail time or high fines for those involved. DNR officers also assist with efforts to clean up areas of their state and with helping the local wildlife populations thrive. What are the General Requirements of the Job? While the skill set is the same, the general requirements for working as a DNR officer vary from state to state. Most states require that applicants be at least 21 years old and have a minimum of an associate’s degree. Some states also ask that applicants be at least halfway done with a bachelor’s degree or that they show they served in the military in lieu of continuing college. Many states have a rigorous and strict training program that shows officers how to investigate potential crimes, discharge firearms, arrest suspected criminals and perform the other duties of the job. It can take eight months or longer from the time you apply for the position to the time you finish training. 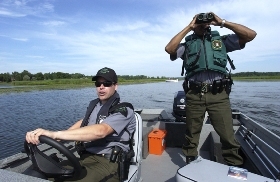 How Much do DNR Officers Make? DNR officers have the chance to make a high salary. Though it varies based on where you live and how long you worked for the DNR, you can start out making $30,000 or more each year. Most states make you go through a probationary period that can last for up to one year. Once you successfully complete your first year on the job, your salary increases significantly. Some DNR officers make more than $60,000 a year. Will a Criminal Justice Degree Help You on the Job? A criminal justice is a valuable degree to be a DNR officer for a number of reasons. The courses in these programs show you how the judicial system operates and the connections that exist between the different levels of the government. Many programs require that students perform a high level of research, which can help you when it comes to researching and investigating crimes. If you work in the same state where you attended school, you’ll also gain a familiarity with the laws in your state and how those laws apply to your work with the DNR. The Department of Natural Resources prevents crimes that can significantly damage the environment and both the people and animals living in the area. A criminal justice degree is a valuable degree to be a DNR officer because it shows you how the DNR uses the laws of the state to investigate crimes and arrest and convict those responsible for crimes against nature and animals.